The University at Buffalo men's basketball team has named Jim Whitesell head coach, athletic director Mark Alnutt announced on Saturday afternoon. 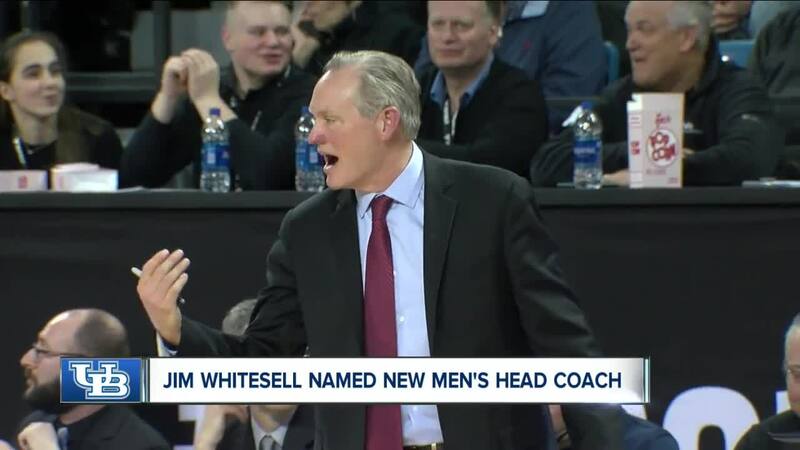 BUFFALO, N.Y. (WKBW) — The University at Buffalo men's basketball team has named Jim Whitesell head coach, athletic director Mark Alnutt announced on Saturday afternoon. Whitesell has served as an associate head coach for the team for the last four seasons. Whitesell becomes the 14th head men's basketball coach in school history. “After conducting a national search and talking with some of the brightest college basketball minds across the country, it was clear to us that the best candidate for this position was right here in Buffalo,” said Alnutt. “Jim’s basketball IQ is unmatched and his professionalism and care for our student-athletes is second to none. Beginning with his recruitment of CJ Massinburg and others, Jim’s vital involvement in player development and game-planning was a huge part of the success of our basketball program over the last four years. Whitesell replaces Nate Oats who was named head coach at Alabama last week. “I want to thank Mark Alnutt, President Satish Tripathi and the entire search committee for this opportunity to lead the Buffalo men’s basketball program,” said Whitesell. “This would not have been possible without the dedication and hard work of the fantastic young men at UB that I have had the privilege of coaching every day. My wife Connie and I are so excited for this opportunity and to remain in Western New York, a place that has become home for us these last four years.